The number and magnitude of weather anomalies and disasters related to Climate Change that are occurring daily all over the world should have elicited a commensurate response from the governments of the world to stop this sure path to the extinction of most species on Earth and to the destruction of civilization. Nevertheless, there are no massive responses to deal with the catastrophic trend and the few governments that openly talk about Climate Change call it “The New Normal” and predict the end of the world, without engaging in the all-out effort for Climate Restoration and Climate Change Adaptation, without which there is no hope of recovering the Climate that allowed humanity to survive and thrive, and of protecting the biosphere from being destroyed. The status quo of the established socio-economies, with wealth distribution greatly favoring the very rich, is still more important than making all the necessary transformations needed to have a livable world for all. Greed still runs the human world, even when annihilation is the likely future for humans (including the rich themselves). California is a test ground of the future of humanity, where Governor Jerry Brown makes doomsday statements about warming and vector diseases elicited by Climate Change, killing billions of humans, and about fire “storms” being the New Normal that we are not ready for, while not offering any leadership to immediately mobilize, with all the might of California, to make California a Climate Change-Ready State and inspire the rest of the world to follow suit. Climate Change in California can no longer be a project to gain political illustriousness. It is a clear and present danger with the ability to destroy the fifth economy of the world, just as it is destroying island nations and other smaller and poorer nations. Climate Change is currently the most democratic phenomenon on Earth, where nobody is spared. The leadership the world needs from leaders like Governor Jerry Brown is not about talking about the dangers of Climate Change, making commitments for the future and organizing a Climate Summit for September, it is about transforming society and economy in real time, to meet the demands of a world with a new and changing Climate. If the State of California will not start the transformation, a County can be the beachhead to start that transformation and that’s why we have given Sonoma County another chance to start it for its own sake and for the sake of the rest of California and beyond. Given the extreme fire danger the County is in, we are urging the Sonoma County government to issue a CLIMATE CHANGE EXTREME ENVIRONMENTAL FIRE CONDITIONS STATE OF EMERGENCY DECLARATION FOR SONOMA COUNTY as a first step towards the Climate Change Major Disaster Declaration we have been asking them to issue for over one year. No matter where you live, you can e-mail the Sonoma County Board of Supervisors urging them to declare this State of Emergency. We urge you to issue a CLIMATE CHANGE EXTREME ENVIRONMENTAL FIRE CONDITIONS STATE OF EMERGENCY DECLARATION FOR SONOMA COUNTY NOW, BEFORE this beautiful County gets further destroyed by the kind of fires that are already razing several other Counties in California. Thank you in advance for e-mailing the Sonoma County Board of Supervisors. Also keep the pressure on the Governors by helping this petition grow. California Gov. Jerry Brown has declared a state of emergency for areas impacted by an aggressive wildfire burning south of Los Angeles. 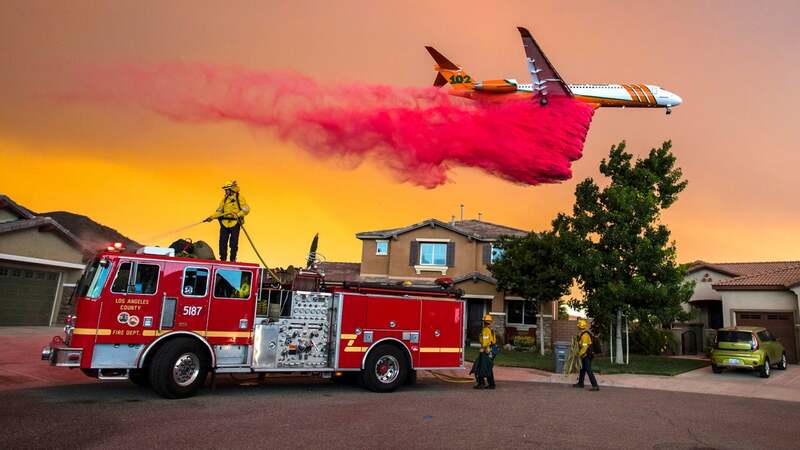 The emergency declaration was issued Thursday for Orange and Riverside counties because of the so-called Holy Fire, burning in the Cleveland National Forest.